New digital music artwork for the Serial Killaz record label. I have worked with the label for many years now, helping to refine their branding, develop their look and feel. As the label has grown and diversified from its original style to incorporate just about every corner of drum and bass music, so too has the artwork got more varied. This latest design is for Jaydan who has put out some huge scene-defining music over the years. 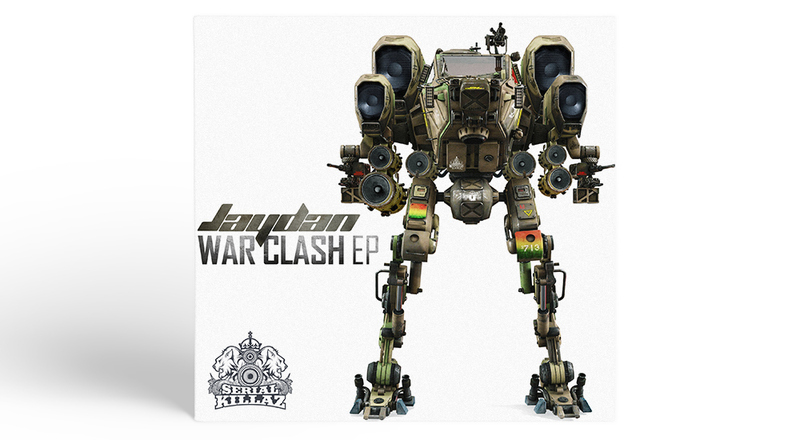 ‘War Clash’ brings forth an intro jacked straight out of 1995, brushed up to date with modern flair and slammed straight into the speaker box. Rolling drums, abrupt bass and twisted out amen breaks – a true recipe for success and a devastating tool for any well-respected DJ. Influences in abundance in the shape of ‘The Whistler’ and it goes without saying that Jaydan has certainly pulled on some previous memories with this one. Jump up from 2005 mixed with upfront jungle breaks that shouldn’t really work as well as it does. ‘Babylon’ features one hell of an atmospheric introduction that slides right into a full on pattern of steppy breakbeats and aggy basslines. This one brings forth the danger! Reminiscing on the supply and demand era of everybody’s favourite media, ‘Vinyl’ is one serious beast. A sense of frustration conveys from not only the vocal samples but the aggressive, spine tingling bassline that comes shortly after the intro. Certainly a mixed bag of styles and flavours from Jaydan. No doubt after hearing you this you will also agree that he’s back on top form and ready to rumble. Here’s to more from this talented producer and DJ.